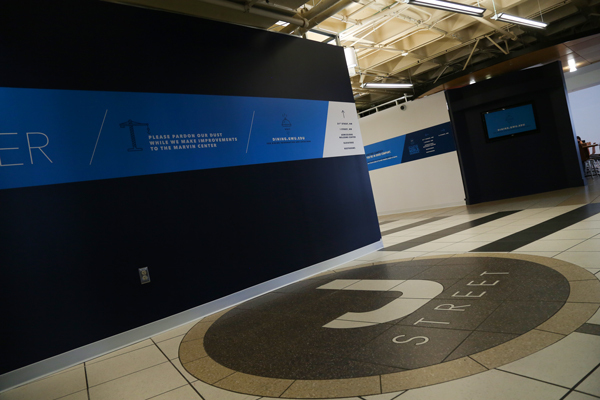 The first floor of the Marvin Center has remained under renovation since the close of J Street. Officials announced Monday that Panera Bread will open in the space. Panera Bread will open in the Marvin Center to replace the space formerly occupied by J Street, according to a University release Monday. Teashi, an Asian-style food restaurant, will also open in Shenkman Hall along with Panera in an effort to offer more “fresh, healthy options” to students, according to the release. The opening dates for the restaurants will be announced this summer. The first floor of the Marvin Center has remained under renovation since the close of J Street, which was Foggy Bottom’s only traditional dining hall, last summer. The space will also feature a “living room” for students, and renovations for that will begin this summer, according to the release. Both restaurants will accept GWorld and will participate in the University meal deals initiative, which allows students to purchase discounted meal combinations for $6, $8 and $10 for breakfast, lunch and dinner, respectively. Officials said they are actively recruiting more vendors to join the meal deals program this summer, but managers of some retailers questioned how often students actually use them. Alicia Knight, senior associate vice president of operations, said that these new vendors will expand the on-campus options available to students under the dining plan. “In the past year we’ve made additions that offer a wider variety of choices and affordable Meal Deals, which helps students get the most mileage out of their Dining Cash,” Knight said in the release. Last year, the University implemented a new “open” dining plan, which allowed students to spend their GWorld dining dollars at any participating vendor on campus. Previously, students were required to spend about 60 percent of their dining dollars at an on-campus dining hall. Officials will also add $200 in dining dollars to each student’s account next year amid affordability concerns.